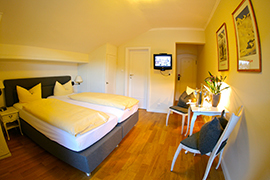 Our 13 (non-smoking) rooms are all uniquely furnished in country house style. All of the rooms feature a spacious balcony with a splendid view of the awe-inspiring mountains of Garmisch-Partenkirchen. All of the rooms have a shower, toilet and cable television. You can enjoy our extensive breakfast buffet in our cozy Tiroler Stube room or on our garden terrace when the weather is nice. We also invite you to stay awhile and mingle at our Stammtisch social events. It is our pleasure to offer you dinner (half board) at our restaurant, which is a ten-minute walk from the hotel in the Garmisch-Partenkirchen pedestrian zone.